A new set of images out of the Far East published on Thursday supposedly show a trio of flex cables bound for the rumored 5.5-inch jumbo-sized version of Apple's "iPhone 6," as well as a set of unfinished micro-SIM card trays. The images, posted to Taiwanese Apple blog Apple Club, show a batch of purported next-generation iPhone components, including flex cables for volume/mute actuators and wake/sleep controls, as well as a curiously long cable with unknown press fit connectors. 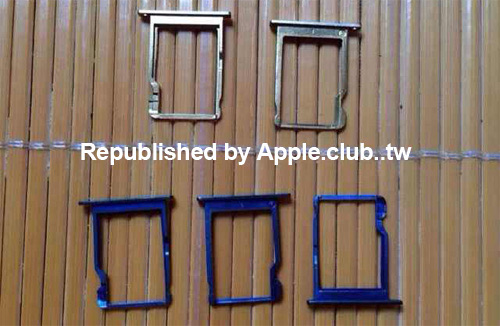 Also published was a set of five micro-SIM card trays that share a similar design to Apple's current iPhone 5s parts. The images are noteworthy because if they are legitimate, they represent one of the first major internal parts leaks for Apple's rumored 5.5-inch iPhone. Thus far, most of the parts that have surfaced have been for an anticipated model with a 4.7-inch display. 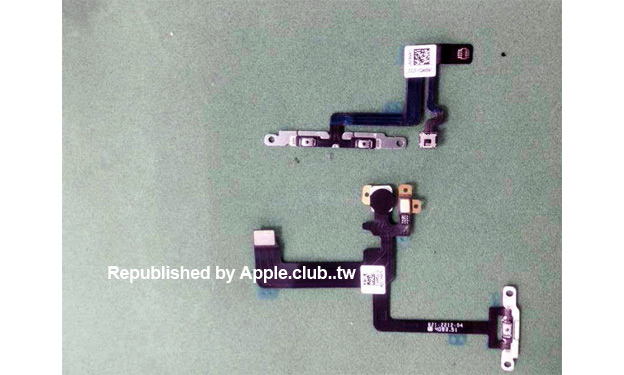 Looking at the photo above, the components are very similar to the single one-piece audio/power flex cable found in Apple's iPhone 5s. If the part is legitimate, the company may have seen a need to break out the audio and sleep/wake functions onto two distinct cables, possibly due to an expected increase in size thanks to the rumored handset's 5.5-inch screen. A closer inspection of the parts reveal the usual button actuators and switches alongside contacts for what will likely be the unit's vibration motor. It is unknown how Apple will arrange the parts, though it appears that the cable contains an infrared proximity sensor and camera mount, suggesting the sleep/wake button will indeed be located on the handset's right side. The exact function of the third flex cable, pictured above, is unclear as it does not contain any obvious components. While speculation, the connector type and shape suggest the part is meant to transfer power and possibly limited control signals from a mating connector running from iPhone's power management circuitry, which are usually positioned near the bottom of the logic board. Also included in the images are five SIM card trays, three of which are colored blue, likely because they are unfinished. If they are somehow legitimate, it would represent a striking new color option for Apple's flagship metal iPhone lineup. 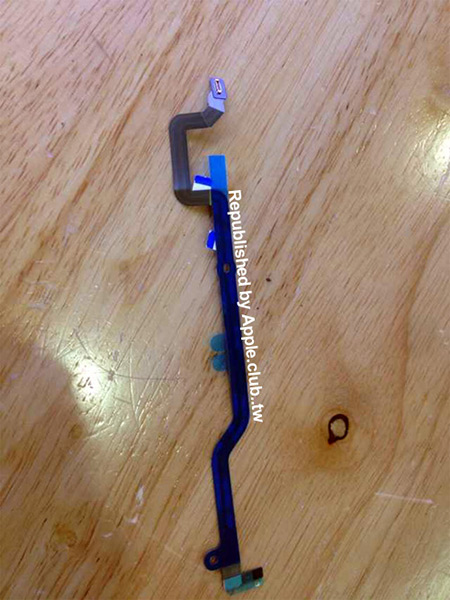 Apple does offer its current mid-range iPhone 5c in blue, but it's in plastic and comes in a much lighter shade than the pictured parts appear to show. To date, there have been no rumors of a blue "iPhone 6," further calling into doubt the image. Apple's current high-end iPhone lineup comes in three colors: space grey, white, and gold, and the gold option debuted last year with the iPhone 5s. Thursday's images add to photos of a "leaked" flex cable containing a Lightning connector, microphone and headphone jack that surfaced online last week. The overall design of that flex cable was largely similar to that of Apple's most recent iPhones, but had a few key differences including additional grounding plates and circuitry, and an unusually large headphone jack.